For the organized and busy professional on the go, the smartphone has quickly become a necessity on par with a persons house keys, wallet, or purse. The past five years have vaulted the smartphone from status symbol to must-have business tool by bringing data and communication capabilities from your office to the palm of your hand. With decision making and communication tools always at the ready, you can be productive from anywhere you are, and you are freed up to bring information to clients, meetings, and conferences without the hindrance of a laptop. Interview With Doug Naegele of Infield: What (Text) Message Are You Sending Your Patients? Q: Tell us about the process leading up to the creation of Infield and how you decided to focus on a mobile application? Infield has always been devoted to mobile. We were originally in the public health space, but we caught the ”˜Health 2.0’ bug and started looking at the intersection of patients and care providers. We honed in on texting because it includes the 60% of patients that don’t have a smart phone. Q: Your product is suitable for a large practice or a hospital. Can you describe how a client would use your product for specific populations or health issues or to enhance a service line? 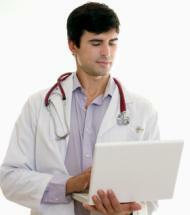 A clinic or hospital would enroll its patients into specific strings of messages based on the patient’s condition. For example, hypertension patients would receive a Heart Healthy Tip-of-the-week, while diabetics might receive weekly tips on diet and exercise. Physical therapy patients could receive texts about stretching or light exercise ideas. The goal is to keep the patient close to the provider in-between visits. An additional benefit to the provider is keeping patients on track with appointments and office visits, thereby driving revenue to the provider. Q: We talked about the client creating the content for the text messages – can you give some examples of text messages that a practice or hospital might send to a patient newly diagnosed with diabetes? Let’s imagine the texts are coming from Valley General Hospital. What’s important is that the patient is receiving gentle nudges to adopt a healthier lifestyle, while also receiving contact data to achieve those results. For the provider, the calls to action often result in increased revenue. 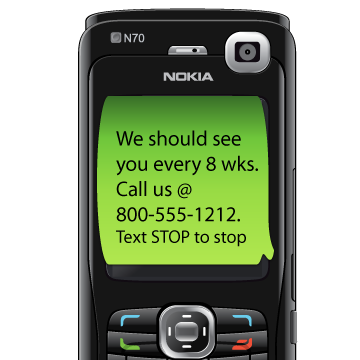 Patients can “Text STOP to stop” at any time to stop receiving messages. Q: What’s the process for connecting the patient with the messages, and who makes that connection? There are two ways. 1. At discharge: the discharge nurse brings up a simple Website that lists the conditions available (diabetes, hypertension, and obesity, for example). He or she chooses a condition, types in a patients phone number, and hits “send’. 2. Self-directed: the patient is handed a business card with instructions on how to self-enroll. “Text HEART to 12345” for English-hypertension. Text “CORAZON to 12345” for Spanish-hypertension. Q: I was impressed that you offer the service in different languages – which languages are available or can you make any language available upon request? Offering content in multiple languages is crucial to reaching patients who don’t use the Internet or e-mail. For example, young Hispanics are 5x more likely to text than use email in any given day. Infield can offer the content in any language that’s supported on a mobile phone. Q: I’ve heard of obstetric practices texting pregnant women and giving them lots of support and information during their pregnancy. Are there other success stories about specific populations or specific illnesses or diseases? You’re referring to Text4Baby ”“ a fantastic example of aggregating patients (pre-natal moms) and offering quick snippits of information. In addition, there are recent examples of texting increasing drug compliance and at-home therapy compliance. We’re offering the ability for individual providers to customize the content and offer it to their patients exclusively. Q: Can Infield handle medication reminders or support group reminders or texts that would be sent on a different time line than 2 messages per week? Yes. We can change the intervals based on what’s best for the patient and the provider. Q: Could your product be launched in a community to improve the health of an entire community and maybe be supported by a grant? Yes. In fact, we are currently on a number of grant applications to offer health improvement through community health initiatives. We worked with the community centers to meet the grant requirements. 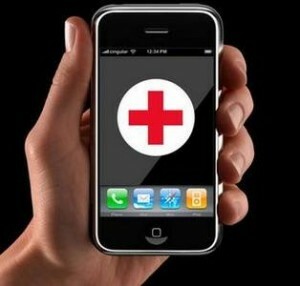 Q: Where do you see mHealth going in the next two years? Can you give us a hint about functionality that your product might have in the near future? The ability for patients to support each other via mobile devices is something we’re very excited about. So, instead of a gentle nudge to improve my health from my doctor, I got one from my best friend or coworker or walking partner. Patients helping each other — one-to-one — is what we’re excited about. Doug Naegele is president of Infield, a provider of mobile solutions that bring patients closer to healthcare providers. Previously he held positions in healthcare banking, technology development, and drug discovery. The latter, at Vertex Pharmaceuticals, yielded numerous US patents and drug candidates for Hepatitis C and autoimmune disease. Doug holds an undergraduate degree from Harvard University and an MBA from The George Washington University. You can contact Doug here: doug@goinfield.com and his company website is www.InfieldHealth.com.